London - Arsene Wenger celebrated the 21st anniversary of his arrival at Arsenal in winning style as the Gunners cruised to a 2-0 victory over Brighton & Hove Albion on Sunday. There are many reasons for Arsenal fans to look back fondly on the day Wenger was hired but, after several years of underachievement, the Frenchman finds himself engaged in a fight to restore his tarnished reputation. 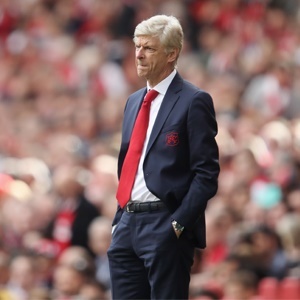 It is too early to predict whether Arsenal can end their 13-year wait to win a fourth Premier League title under Wenger, but there were some encouraging signs as Brighton were put to the sword at the Emirates Stadium. Nacho Monreal opened the scoring in the first half before Alex Iwobi, converting Alexis Sanchez's majestic assist, wrapped up the points after the interval. Arsenal's sixth win from their last seven matches in all competitions moved them to within six points of leaders Manchester City heading into the international break. Fittingly, Wenger marked his milestone date with a notable record of his own. Brighton are the 45th different Premier League club to be defeated by Arsenal since Wenger took over in 1996, breaking the record he shared with Manchester United legend Alex Ferguson. Just 64 hours after winning at Belarus's Bate Borisov in the Europa League on Thursday, Arsenal were back in action and Wenger freshened up his side by making nine changes. Wenger this week claimed Arsenal are a more unified team since the transfer window closed just after their humiliating 4-0 defeat at Liverpool. There was ample evidence to support that theory as his team tore into Brighton right from the start. Alexandre Lacazette almost gave them the perfect start after just 65 seconds when his fierce drive flashed past Albion goalkeeper Mat Ryan, only to cannon back off a post. Albion striker Tomer Hemed was serving the first of a three-game suspension, so Izzy Brown started up front and the youngster went close with a header from Pascal Gross's free-kick. That effort aside, it was one way traffic as Wenger's men left Brighton trailing in their wake time and again. Sanchez and Iwobi tested Ryan from long-range before Monreal gave Arsenal the lead in the 16th minute. Granit Xhaka's free-kick to the far post was headed back by Lacazette and after Shkodran Mustafi had his shot cleared off the line, Monreal chested down and fired home from 10 yards. It was Monreal's first league goal for Arsenal since March 2013 and the Spanish defender celebrated with a fist-pumping roar of delight. Solly March nearly silenced Arsenal's cheers moments later when he unleashed a powerful 20-yard shot that crashed back off a post. The Gunners should have doubled their lead before half-time when Brighton defender Lewis Dunk slipped, putting Lacazette through on goal. But Lacazette let Brighton off the hook with a tame shot straight at Ryan, while Aaron Ramsey saw his low strike repelled by the Australian keeper following an incisive Arsenal counter. Those misses didn't prove a source of regret as Sanchez produced a sublime contribution to set up Iwobi's first goal since January in the 56th minute. Exchanging passes in a blur of movement, Ramsey and Lacazette worked the ball smoothly into Sanchez inside the penalty area. Faced with three Albion defenders, Sanchez knew a shot would be blocked, so he instinctively guided a back-heel towards the unmarked Iwobi, who had the simple task of firing home from eight yards. Sanchez was in irrepressible mood and it took a combined of Dunk and Ryan to keep out his goal-bound shot, before Sead Kolasinac's header was cleared off the line by March.